This Desk Organizer keep your desktop neat and organized with this mesh file and documents organizer. ProAid organizer perfect for office, home, mailroom, classroom, bookstore and anywhere. The file folder is lightweigh / adjustable / removable helps to keep files, letters, books, magazines, paper and stationery. 30-Day Money Back Guarantee, 18 Monthn Replacement Warranty and Lifetime Support Guarantee.Without any risk for shopping!! DURABLE AND STURDY: Being made of metal mesh material, the desk organizer has a solid construction, perfect for organizing letter sized and smaller papers. Besides, it's very easy to clean and see if anything has fallen down for this mesh design. 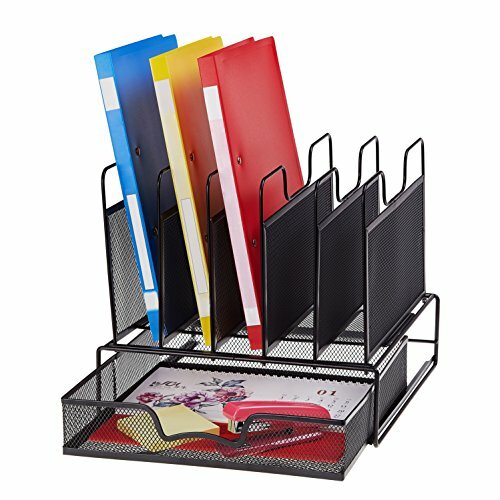 MAKING DESK TIDY & CLEAN: The desktop file sorter has 5 upright file sorting dividers for documents file folders. 1 movable drawer for desk accessories such as pencils, caculators and so on. Keeping your desk tidy and making things easier to find. EASY TO ASSEMBLE: It's very easy to put the file organizer together just according to the assembly instruction in the package. A good solution for your messy desktop, Make everything on the desktop within reach. DIMENSIONS: 12"L x 12"W x 11"H; Taking up a little space, great way to organize your desk well. RELIABLE CUSTOMER SERVICE: The ProAid will be responsible for each of our product, please feel free to contact us at any time if you have any problems. 30-day money back guarantee, 1 year replacement warranty and lifetime customer service guarantee. If you have any questions about this product by ProAid, contact us by completing and submitting the form below. If you are looking for a specif part number, please include it with your message.